My second time on the Dream and it was once again quite pleasant. We departed from New Orleans and embarcation was a breeze. From curb to poolside took us less than 15 minutes. Very efficient! The ship was nice, no complaints there. Always clean, never had to wait at a bar or at the buffet, service in the dining room was impeccable and though I found selection very limited in both the buffet and dining room, what there was was of good quality and tasty. The steakhouse was of course delicious and service was excellent. We booked the Captain&apos;s Table and as usual it was worth every penny. Food, service and entertainment were top notch and having the table in the kitchen and not a glassed off room was super interesting. The theatre shows were very good, but some were the same I already saw on the Vista 2 years ago. Excellent performances none the less. Piano bar sadly was not that great. Cabin was a standard balcony on the 7th deck. Clean, quiet, comfortable and a very good stateroom attendant. It was just what the doctor ordered to shoo away the winter blues. :) My only real complaint about the ship would be that Carnival replaced the amazing Tandoor Indian restaurant with an upsell seafood restaurant. That was a huge disappointment. 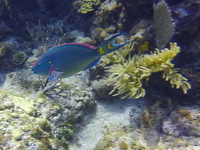 Ports were Roatan, Belize and Cozumel and I scuba dived in every port using Carnival&apos;s excursions. All the dives were excellent. 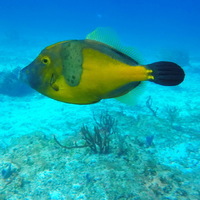 I specially enjoyed the dive operator picking us right at the ship in Belize. Debarcation was a breeze as I was staying in New Orleans for a few days. I choose one of the latest tags and got off the ship around 9:30am with almost no lines thru customs. My second time on the Dream and it was once again quite pleasant. We departed from New Orleans and embarcation was a breeze. From curb to poolside took us less than 15 minutes. Very efficient! The ship was nice, no complaints there. Always clean, never had to wait at a bar or at the buffet, service in the dining room was impeccable and though I found selection very limited in both the buffet and dining room, what there was was of good quality and tasty. The steakhouse was of course delicious and service was excellent. We booked the Captain&apos;s Table and as usual it was worth every penny. Food, service and entertainment were top notch and having the table in the kitchen and not a glassed off room was super interesting. The theatre shows were very good, but some were the same I already saw on the Vista 2 years ago. Excellent performances none the less. Piano bar sadly was not that great. My only real complaint about the ship would be that Carnival replaced the amazing Tandoor Indian restaurant with an upsell seafood restaurant. That was a huge disappointment. 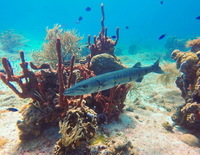 Ports were Roatan, Belize and Cozumel and I scuba dived in every port using Carnival&apos;s excursions. All the dives were excellent. I specially enjoyed the dive operator picking us right at the ship in Belize. Debarcation was a breeze as I was staying in New Orleans for a few days. I choose one of the latest tags and got off the ship around 9:30am with almost no lines thru customs. Standard balcony port side near the aft of the ship. Clean, quiet and well situated with cabins all around (no noisy bars, restaurants, elevators or service corridors near). 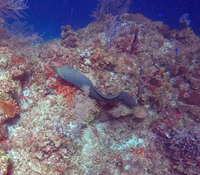 The dive site was a good 40 minutes from the ship, but was well worth the ride. As a bonus a pod of dolphins circled our boat for a few minutes between the 2 dives. Appreciated having the dive boat pick us up right at the ship and not having to tender to the port. Nice dives. Larger boat but group split into smaller (max 6 divers) groups each with our DM jumping in at different sites. 2 very nice drift dives. Operator was Anthony&apos;s Key, great operator and our DM Hector was amazing.